In an earlier post here, we discussed warrant in corporate law and Securities law. In another post here we discussed, we discussed issues related to Share warrant and bottle neck making it impossible to issue share warrant as we know in corporate law. In this post we will discuss warrant as in securities law. Securities and Exchange Board of India (SEBI) regulates Securities Market in India. It makes regulation for issue of any securities by a company within set parameter of the Companies Act, 2013. Securities Market is very innovative and so the market regulator. SEBI (Issue of Capital and Disclosure Requirements) Regulations, 2009 [ICDR Regulations] regulates issue of these securities to general public. Many securities available to listed entities may not be available to unlisted companies. Regulation 4(3) of ICDR Regulations primarily allows issue of warrant. 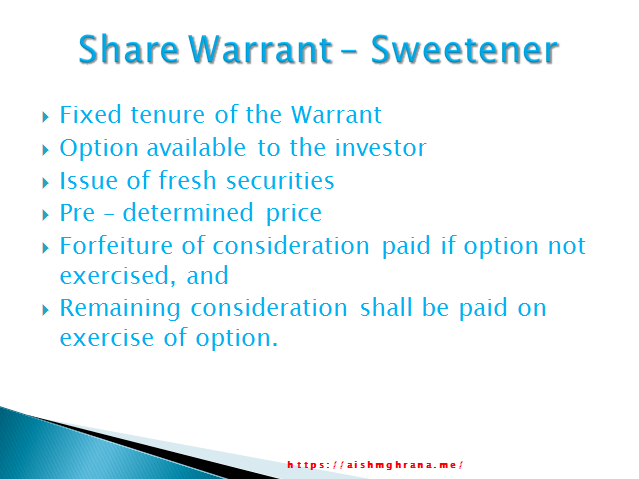 (d) in case the warrant holder does not exercise the option to take equity shares against any of the warrants held by him, the consideration paid in respect of such warrant shall be forfeited by the issuer. Further Regulation 77 adds some conditions. According to Regulation 77, an amount equivalent to at least twenty five percent of the consideration determined in terms of Regulation 76 shall be paid against each warrant on the date of allotment of warrants. The balance seventy five percent of the consideration shall be paid at the time of allotment of equity shares pursuant to exercise of option against each such warrant by the warrant holder. In case the warrant holder does not exercise the option to take equity shares against any of the warrants held by him, the consideration paid in respect of such warrant shall be forfeited by the issuer. Remaining consideration shall be paid on exercise of option. A comparison of warrant – the bearer instrument and warrant – the sweetener may reveal fine difference of these two instruments. As Companies Act, 2013 practically does not allow warrant – the bearer instrument all reference to warrant shall soon be understood as warrant – the sweetener. However, Share Warrant as warrant – the bearer instrument issued under shall continue to be in existence until their period as per original terms and conditions come to an end. A company is governed primarily by the Companies Act, 2013. Warrant – the sweetener shall be governed by the Section 23 (discussed earlier here) read with Section 42 (discussed earlier here) and Section 62 (discussed earlier here). In case of listed companies, ICDR Regulations shall also apply. According to ICDR Regulations, such Warrant may be issued for specified securities – Equity shares and convertible securities and may be attached with debt securities [Regulation 4(3) read with Regulation 81(a). Explanation (ii) to sub – rule (1) of Rule 13 of the Companies (Share Capital and Debentures) Rules, 2014 has indirect mention of share warrant. It reads, “For the purposes of this rule (Rule 13), the expression, “shares or other securities” means equity shares, fully convertible debentures, partly convertible, debentures or any other securities, which would be convertible into or exchanged with equity shares at a later date”. Accordingly Rule 13 (discussed earlier here) shall apply. This entry was posted in Chapter IV - CA2013, Companies Act 2013 and tagged Bearer Shares, Share Warrant, Sweetener, The Companies Act 2013, Warrant. Bookmark the permalink.